Its quiet hidden gems, exotic forests, local shops, popular restaurants and nightlife all attracts people from across the city to this affluent enclave in Zona Sul (South Zone). RIO DE JANEIRO, BRAZIL – A short stroll along Rua Marquês de São Vicente to Praça Santos Dumont quickly reveals how eclectic the small neighborhood of Gávea can be. Its quiet hidden gems, exotic forests, local shops, popular restaurants and nightlife all attracts people from across the city to this affluent enclave in Zona Sul (South Zone). The Instituto Moreira Salles in Gávea has high-quality exhibitions as well as a beautiful garden, photo from Wikimedia Creative Commons. Frequently overshadowed by its well-known neighbors Jardim Botânico and Leblon, Gávea hides a unique charm, having a strong connection to the arts. “Such a small neighborhood has so many options for shopping, eating and particularly culture. But what sets Gávea apart are the ‘Gaveanos’ – bohemian, cultured, fun-loving and friendly – whether they’ve lived here or, like me, adopted this little jewel of a place to live,” claims Guy Smith, a coordinator at The British School of Rio de Janeiro. Places like Instituto Moreira Salles highlight the range of architecture in the neighborhood. Once the home of banker Walter Moreira Salles, the modern building is now an art gallery nestling in the jungle where numerous visual arts, cinema and photography events take place. As an indoor activity, Shopping da Gávea is a must-go place especially to watch a play at one of its four theater halls. For the culinary scene, the options around the neighborhood are endless from traditional Brazilian to stylish burger bars. For breakfast, Talho Café (10, Rua Marquês de São Vicente) is hard to beat, with a wide variety of bread, sweets and juices. One of the most popular spots for Cariocas, Braseiro da Gávea is always a good idea for an ice-cold beer or a Picanha ao Braseiro (R$120, serving up to three people). With a similar ambiance, you can also find Garota da Gávea, Hipódromo and BG Bar, all of them being meters away from each other, at Praça Santos Dumont. Especially on Thursday nights, the square becomes a big open street party. Popularly known as BG (short for Baixo Gávea), the meeting point brings together the young and stylish and is popular with the nearby PUC university students and bars close at 1AM due to noise regulations. Lounge bar Palaphita Gávea has a great atmosphere for meetings, dancing and drinks/ Facebook reproduction. For those that want to carry on with the festivities, the lounge bar Palaphita Gávea – at Jockey Club – offers an upbeat environment with DJs often playing until 4AM. Unfortunately traffic in the region can be quite heavy during rush hour, making walking the best option for short distances. The main culprit for the congested roads is because Gávea is right outside the tunnel connecting Barra da Tijuca to Zona Sul. “It’s a nice neighborhood, full of opportunities and amusements, but the chaotic traffics annoys me tremendously,” states Karl Erik Schøllhammer, a Norwegian expat who has lived in Rio for thirty years. Another pain-point for locals is the metro subway system that has not yet reached the area. Line 4 extension to Gávea was expected to be completed before Rio’s Olympics but has been on hold since April 2016 instead. On the meantime, there is a bus called Metrô na Superfície (Subway Bus) that connects the future stations to both Botafogo and Antero de Quintal (Leblon). Real estate in Gávea can be pricey as it figures among the top five most expensive areas in Rio (and Brazil), right behind Leblon, Ipanema and Lagoa. For buyers, the square-meter costs an average of R$17,240, according to the latest FipeZAP Index. As a result, it has the highest GDP among the neighborhoods of Rio. A small one-bedroom apartment on Rua Marquês de São Vicente can be found for R$750,000 and a two-bed right in the heart of Baixo Gávea may be listed for R$1 million. 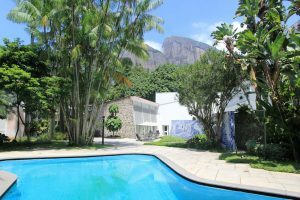 Larger upscale 4-bedroom apartments on the green and quiet landscapes of Gávea Road are as expensive as R$5 million and 800 square-meter mansions can impressively cost up to R$14 million. The rental for a 50 square-meter single room apartment on Padre Leonel França Avenue is about R$1,700. For short-term stays, AirBnB has options that cost from R$85 to R$2,500 a day.